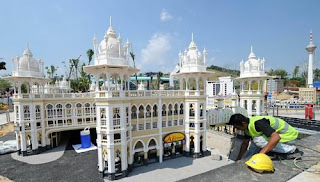 JOHOR BARU (ANN) - Thousands of excited and curious visitors have been visiting Legoland Malaysia to take photographs and admire the exterior although the park is only scheduled to open on Sept 15. Some visitors were there to collect annual passes but the majority were only there to get a first glimpse of the much-talked-about theme park. Engineer Jesper Bruhn, 40, from Denmark, said he was pleasantly surprised to find that the theme park was very similar to the one in his home country. "It feels familiar, which is something I did not expect," he said, adding that he had travelled to the theme park with his family to redeem their yearly passes and catch a glimpse of its interior. Mr Bruhn added that he had to queue for about 90 minutes for the passes but it was worth the wait. "I cannot wait for the park to officially open," he said.